About two weeks ago after I covered my last high school basketball game I thought basketball season was over. But little to he hold the Bowling Green Falcons got a first round bye in the Womens National Invitational Tournament and would host Syracuse at home. This being one of very few tournaments held at Anderson Arena it turned out to be a very exciting game. Basketball season is half way over! Finally, basketball season is half way over! I am starting to get burned out with basketball because everything is starting to look the same and I have shot the same feature photos about ten times now. I have shot all levels of basketball, from NBA to JV. Having covered such a variety of competition levels, I have seen some crazy dunks to turnover every time a player gets the ball. After a long weekend of shooting a favorite of events I spent most of Monday relaxing watching a movie and catching up on TV shows. 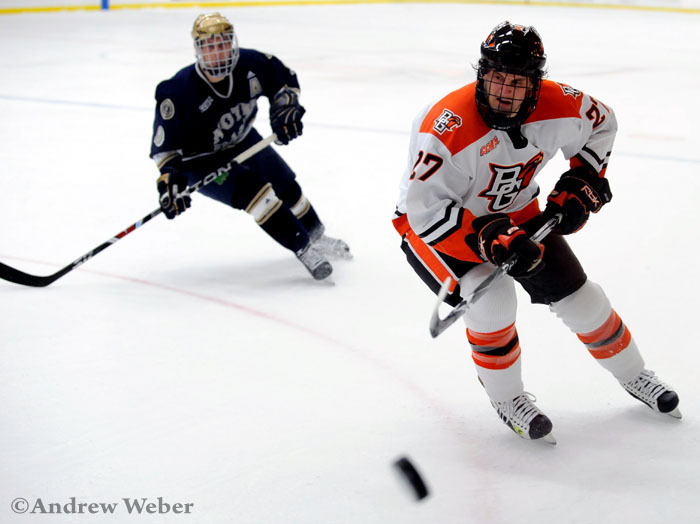 Bowling Green was playing Towson Tigers so I headed down to BG to shoot the game. Instead of take the usual route, I decide to go up in the cat walk and shoot half of the game from up there. I would first like to start off that I have been neglecting the blog because its FINALS WEEK and time to buckle done for the final week so I can finish up strong. On December 6th almost two weeks ago (oops!) I shot Perrysburg vs. St. Francis boys basketball. One thing about shooting high school basketball is you never know just how exciting its going to turn out, like this game did. I was planning on getting there early to avoid traffic and work on getting stock images and player feature shots but that didn’t happen. I got stuck in traffic and made it there just before tip off. I am going to stop jabbing on and just post some images because I have three more posts to get done! This was an extremely busy weekend for me. Lets start with Friday. I hung out most of the day watching football then around 1:00 pm I head to the football stadium to get ready for the battle of I-75. The battle of I-75 is a college rivalry game between the University of Toledo and the Bowling Green Falcons. Just 25 miles separate the two schools. Yesterday was an extremely busy day for me. I spent most of the day relaxing after an exciting win over the Miami Redhawks. Around 2 o’clock my boss called and said there was a huge barn fire not to far from me. I gather my gear jumped into the car and was off looking for the barn fire. When I got to the destination the barn most burned to the ground and the fireman spent most of the time trying to get the flames and the smoke to die down. I fired off a few shots there then it was off to shoot #9 Notre Dame vs. 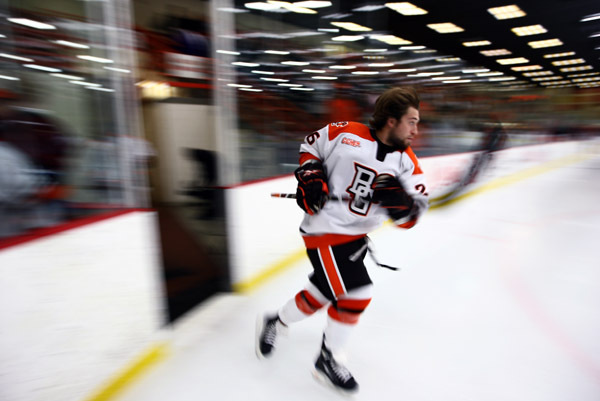 Bowling Green Falcons hockey. First Snow Fall and College Hockey. I started off the day by sleeping in to around noon. I hate a late breakfast did some work on some school work then I started to get ready to head 15 miles down to Bowling Green to shoot Bowling Green Falcon Hockey vs. Northern Michigan. As I got all of my gear packed up and headed out to my car I had no idea it snowed. Here is a little fun pic of me.